”] I don’t know what planet Danny Boyle was on when he accepted the screenplay for Sunshine. I have obviously completely forgotten about The Beach, and my dislike of anything involving Alex Garland. In fact, I think I’ll try to weave the question of whether people like The Beach into all first dates from now on. It’s almost excusable to like it if you are 23 and have substance abuse issues of your own – so presumably you watch it with a kind of nervous Schadenfreude. In any other circumstance, it’s just a plot full of holes and some annoying camera work. 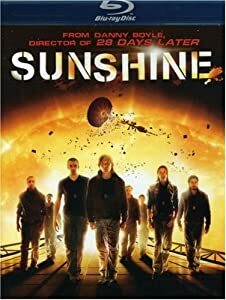 Anyway, Sunshine is about some astronauts who go on a suicide mission to “fix” the sun by lobbing a bomb into it. It had Solaris written all over it from the first frame, it completely misses the sense of mystery that makes Solaris a great film. Garland seems think that if his script says “something strange happens” every 20 minutes, this will do the trick. When the chief scientist destroys half the spaceship by forgetting to change the angle of the shields, it struck me as completely ludicrous to have a procedure prone to potentially fatal mistakes being executed by one single person. If the name of the ship (Icarus II) hadn’t already told us this was a doomed mission, we could now be quite certain that none of the characters would be doing a victory lap around Houston. In fact, things became more predictable than I could possibly imagine, in a really bad way. A bit like Event Horizon, only minus any of the psychological tensions, and with a bit of theosophy thrown in. Giant waste of £1 and two hours, apart from the fact that Cillian Murphy is beautiful.